Valerie Hare – Co-founder of the SHAPE of enrichment, part 2 (Episode 30). Val is currently the chief financial officer and workshop coordinator for the shape of enrichment incorporated. She’s also worked as a research animal care supervisor at the Massachusetts general hospital, and zoo keeper at san Diego wild animal park, a behavioral research technician at the san Diego zoo and of course now as an enrichment consultant. 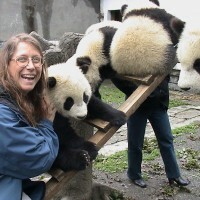 Valerie has also served on the international conference on Environmental enrichment committee since 1997 and served in the bear care group board of directors between 2007 – 2014, she’s a member of the animal behavioral management alliance the ABMA … and of various zoo keepers associations from around the world. Val holds a bachelor’s degree of science in Biology with an emphasis on zoology from san Diego state university and an associate’s degree as a veterinary technician from the state university of New York. CLICK HERE for information about the up and coming International conference on enrichment conference happening in Bogota Columbia. CLICK HERE for the SHAPE of enrichment website. Listening to this a bit late – LOVE it! And the comments about show holding areas especially, something I think about a lot. 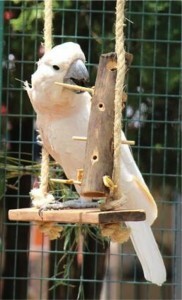 This is a point I’m trying to make for people with pet parrots as well. Training sessions and spending 3-4 hours outside of a commercial cage each day is simply not enough. Great couple of episodes and I absolutely love SHAPE and Valerie’s work!